305 mm/61 SM-313 х 3 pcs. AP Shell305 mm AP Model 1928. 130 mm/60 BL-109A6 х 2 pcs. 25 mm 4M-12010 х 4 pcs. 45 mm SM-20-ZIF6 х 4 pcs. Stalingrad — Soviet Tier X cruiser. Stalingrad was first released for sale with Update 0.7.8 and is available exclusively via the Arsenal. Tier X Premium cruiser Stalingrad is a ship that behaves very similar to her tech tree cousin Moskva. Both are very strong at locking down a position and are equipped with accurate and hard hitting AP shells that travel across the map quickly. However, Stalingrad is more polarized and less flexible than her tech tree counterpart. Worse maneuverability and concealment make mistakes in positioning and relocating attempts risky, and can result in very painful salvos coming in. Stalingrad makes up for this by having even more hit points than Moskva, and having a more powerful main battery armament. Stalingrad’s strongest feature is her main battery. Carrying three triple turrets with 305mm/61 rifles in an AB-X layout, she will be able to deliver devastating salvos against many targets. Her accuracy is a rather weird case. With a dispersion ellipse similar to the German heavy cruiser Admiral Graf Spee married to the highest sigma value in the game at 2.65, there are two extremes meeting when shells are being fired. The chance for shells to land closer to the center is higher than on other cruisers, but it remains possible for the shells to land further off the target than on any other cruiser. The reload time her guns is very long: twenty (20) seconds before applying modifications or skills. Thus, Main Battery Modification 3 ( ) is highly recommended to bring the reload down to 17.6 seconds, with Adrenaline Rush reducing the reload further as Stalingrad takes damage. With a comfortable range of 20.4 km, Stalingrad can inflict damage to her opponents from far away. Stalingrad boasts a robust health pool for a cruiser. With 72,450 hit point, she beats out Tier IX Premium Kronshtadt to claim the mantle of largest health pool of any cruiser in World of Warships. With a torpedo protection system of 25%, she can handle incoming torpedoes better than most other cruisers. Similar to Kronshtadt and Admiral Graf Spee, a fire on the Stalingrad will burn for 45 seconds base duration. This makes her more vulnerable to fires than a cruiser, but less vulnerable than a battleship. Her armor is an almost identical scheme compared to her tech tree counterpart. Her citadel, just like Moskva’s, has been widened from the historical plans which creates a weak spot in her armor scheme. The citadel touches the outer hull slightly above the waterline, and is protected by a 180mm strong belt. Below this, the citadel protection becomes stronger. The outer belt of 180mm inclined armor continues, but behind that there are additional bulkheads with the same incline protecting the magazines. This can result in shells getting armed but exploding before penetrating the citadel. Also similar to Moskva, Stalingrad features 50mm hull plating. This will mostly benefit the ship when it's being angled properly, as it can make all AP shells bounce off and most HE shells will just shatter against it. However, not every part is covered in this plating. Half of the bow and a lot of the stern area is not protected by this and only has a 25mm plating, which will get overmatched by every battleship Stalingrad will face. Angling is essential to maximizing Stalingrad’s survivability; once an opponent has shots at her side she will fall apart just as quickly as any other cruiser. Armor-piercing shells are the more powerful shell type to sling from Stalingrad’s barrels. They feature good ballistics, a strong penetration and also a high base damage of 9,200. On top of that, these shells have improved autobounce angles similar to American heavy cruisers; Stalingrad’s AP shells will not automatically ricochet off enemy armor until striking at an angle of greater than 65 degrees. This is significantly better than on most other cruisers. The caliber of the guns provides another bonus: her 305mm armor piercing shells have the ability to overmatch 21mm of armor. That means that Stalingrad can citadel British light cruisers from all angles, and that against destroyers she can also just stick to AP for the first salvo, since the shells will not bounce and deal 10% if the listed Alpha Damage per hit. The HE shells appear strong, but the relatively low rate of fire makes HE a rather unattractive choice of ammo as it's not enough to rack up high damage numbers. The amount of shells she can throw out is not enough to make her a reliable fire starter like Zao or Henri IV; subsequently, the HE shells should be seen as the secondary shells, with the main focus being on the AP to deal damage. However, when facing destroyers exclusively using HE shells is recommended. In terms of maneuverability, the Stalingrad is very similar to the Moskva. When sailing in a straight line she can be very fast, up to 36.8 knots when using the Sierra Mike signal flag. However once she has to maneuver problems will arise. With a turning circle of more than 1100 meters she has a larger turning circle than the German Tier X battleship Großer Kurfürst, which is already known for needing a lot of room to maneuver. On top of that, Stalingrad’s rudder shift is slow at 12.5 seconds, which is the worst value of any Tier X cruiser. Additionally, her concealment is the worst among all cruisers. With a stock detection radius of 18.1 km, this is not an easy ship to hide; extreme caution is advised when attempting to relocate. The capabilities of Stalingrad in a brawl are very limited, owning to her large citadel which is easy to penetrate at close ranges and her lack of maneuverability. The absence of Hydroacoustic Search ( ) among her available consumables only strengthens this weakness, as does the lack of torpedoes. Her targets of choice are broadside targets at all ranges, and destroyers that wander too close. The accurate and fast shells will allow for punishing salvos, regardless of the target, while the ship itself will be able to take a lot of punishment. However, all of these things rely on two key factors: situational awareness and positioning. Stalingrad is not able to survive in unfavorable circumstances, and her ability to get into better positions throughout the battle is severely hampered. Only capable hands will be able to get the most out of Stalingrad. Largest hit point pool of any cruiser. Very fast, at 35 knots top speed. Guns are accurate, with a sigma value of 2.65. Fantastic AP shells, with improved autobounce angles and reduced shell arming time. Has access to Defensive AA Fire ( ), though it operates differently to the standard. High citadel makes brawling a challenge. Relatively ineffective if forced to use HE. Worse concealment than many high tier battleships. As a premium ship, Stalingrad doesn't have any upgrades to research. Upgrade Slot 2 allows players to extend the duration of the Surveillance Radar consumable if they have the appropriate special module available in the Arsenal. Upgrade Slot 3 allows for further specialization in a role. Players wishing to decrease shell dispersion should mount Aiming Systems Modification 1 ( ). For anti-aircraft duties, AA Guns Modification 1 ( ) should be chosen. For increased brawling capabilities, some players may opt to mount Main Battery Modification 2 ( ) to increase turret traverse speed. Upgrade Slot 4 provides two viable options. For increased survivability, Damage Control System Modification 2 ( ) is a good choice. However, many players utilize Steering Gears Modification 2 ( ) or Propulsion Modification 2 ( ) to increase the maneuverability of the ship. Choosing between these upgrades will be determined by the intended playstyle. Upgrade Slot 5 gives players a choice between Steering Gears Modification 3 ( ) for increased maneuverability and Concealment System Modification 1 ( ) to reduce the detection range of the ship. If Steering Gears Modification 2 ( ) was not mounted in Slot 4, it is highly recommended to mount Steering Gears Modification 3 ( ) to improve the ship's handling. Upgrade Slot 6 provides the most options for specialization. Main Battery Modification 3 ( ) should be mounted to increase the rate of fire of the main guns. For more passive players, Gun Fire Control System Modification 2 ( ) is a good option to increase the firing range of the main guns. Players seeking to finalize an anti-aircraft build should mount AA Guns Modification 2 ( ). Key skills for Stalingrad commanders include Expert Marksman, Superintendent, and Concealment Expert. Captains looking to improve the ship's survivability should consider Basics of Survivability and Fire Prevention. High Alert and Jack of All Trades can be mounted to reduce consumable cooldown timers. Lastly, Advanced Firing Training and Basic Firing Training can be used to improve the ship's anti-aircraft armament. Slot 4: Defensive AA Fire ( ) Note: This version of the consumable acts differently to the standard. The action time is 60s and the damage multiplier is 2x as opposed to the standard 3x. The cooldown is also longer at 240s base and 180s premium. As a premium ship, Stalingrad comes included with Type 20 camouflage that lowers her detection radius, reduces the accuracy of incoming shells, reduces her repair costs, and increases the amount of experience she earns. 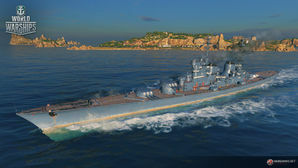 Stalingrad is a unique ship, but her signal load out is fairly standard for a cruiser; only difference being in the relative uselessness of the two fire chance flags, as she already possesses a 33% burn chance. Being a Tier X Premium ship, economic signals are a good option to increase the various currency gains. The genesis for Project 82 (Russian: Тяжёлые крейсера проекта 82) began in 1941 with the requirement to design a “heavy cruiser” that would fulfill operational roles between the Kirov-class light cruisers and the then-under construction Project 69 large cruisers. The requirement of these ships was to focus on engaging enemy light cruisers, with secondary roles to disrupt enemy communications and logistics. For this role, the original preliminary designs considered a vessel of 20,000 tons displacement, armaments comprised of 203mm main battery guns, a 36-knot speed, and a range of 10,000 nautical miles at 20 knots. Many of these details were adopted from the design processes behind Project 69. Initial debates did foresee an increase of displacement to 25,000 tons and an upgrade of main armaments to a proprietary 220mm caliber, but the commencement of Operation Barbarossa put the work on Project 69 and Project 82 on hold. The project was revived again in late 1943, this time with updated requirements to the role of the new vessels: the protection of friendly naval aviation assets as part of a new combined carrier force doctrine. Most of the original parameters were retained, save for the replacement of the torpedo launchers with more anti-aircraft batteries. A re-assessment in late 1944 included further modifications: a reduction in top speed to 33 knots, a main battery of 220mm, increase of secondary batteries to 130mm guns, as well as the addition of heavy anti-air batteries in the form of 45mm, 37mm, and 23mm (later changed to 25mm) cannons. The Soviet Navy was satisfied with the aforementioned specs, but the shipbuilding committee prevented further progress due to a lack of a foreseeable necessity of heavy cruisers. Regardless, the Navy was undeterred and continued on; in their eyes the new vessels would be used defensively to protect Soviet coasts and engage enemy carrier groups. Interestingly, in a government assembly in 1945, the General Secretary of the Community Part himself, Josef Stalin, requested that the main battery caliber be increased to 305mm; this later became treated as an official decree. More pressingly, the Soviets at the time were incapable of building large ships, so any new vessels would only be improvements of current designs under construction. Therefore, the compromise agreed upon was the allow time for infrastructure to develop, optimistically by the early 1950s. Subsequently, further design discussions were postponed till the late 1940s. When such work was re-started, the Navy and the Shipbuilding Committee put for a joint proposal of the preliminary design: main battery between 220-305mm, 40,000 tons displacement, a 150mm main armor belt, and a 6,000 nautical mile range at 18 knots. The specs were given to design bureau TsKB-17, who created 4 sketches; mostly differing in the secondary battery and machinery layout. One sketch was selected and the technical design was started but Stalin intervened. He wanted a smaller ship with a top speed of 35 knots, so the rear secondary turrets and their respective magazines were deleted. The Navy did not approve of these changes — as they saw this as a compromise of the ship’s ability to engage heavy cruisers — but Stalin’s reasoning was as such: he envisioned the purpose of the Project 82 vessels to fight light cruisers. As the cruisers would fight close to friendly ports, their ammunition supplies could be sacrificed. He believed aircraft engaging the ships would have to fly low, so a large secondary battery was not as critical. Additionally, light AA could be sacrificed as escorting ships would be tasked with providing cover. The final technical design was completed and approved by 1950. A final review in 1951 added a clipper bow — increasing the length of the ship by 10 meters — and the belt was thickened by 30mm. Had she been completed in her early 1950s configuration, cruiser Stalingrad (Russian: Сталинград) would have been 273m long, 32m wide, with a 9m draft. Her hull was to be of completely welded construction, and she was the first Soviet warship with a complete flush deck from bow to stern. Furthermore she had reinforced construction in the shape of a triple bottom hull and 23 separate watertight compartments. To achieve the planned 35-knot speed the designers opted for a total of 12 water-tube boilers feeding into 4 geared steam turbines, generating a potential of 280,000 shaft horse power. The machinery would have been organized into an alternating configuration of boiler rooms and turbine rooms, with each boiler and turbine room housing three boilers and two turbines, respectively. Stalingrad’s armor scheme was complex. Despite the requirement asking for immunity against cruiser caliber weapons between 12 – 30 km engagement distances, approximately 10,000 tonnes of displacement was planned to be dedicated for just armor; a staggering 29% of the ship’s total weight. A main belt 180mm thick, with supplementary armor of 50 and 100mm thick found above and below the main belt protected the citadel. The belt itself would have been slanted by 15 degrees to work against both plunging and horizontal fire; it ran 60% of the length of the entire ship. Transverse bulkheads of 125 and 140mm thickness would close off the citadel fore and aft, respectively. There would have been a triple layer of armored decking covering the citadel; 50, 75, and 15 mm thick respectively. Other heavily reinforced sections would have included the turret housings, barbettes, and conning tower; all over 200 mm thick. The torpedo protection system is of further emphasis. It would be similar to the one that was pioneered on the Project 69 cruisers. It consisted of a pair of external bulges with 4 parallel armored bulkheads sandwiched inside. The inner two layers would be filled with oil while the outer layers filled with air, rated to withstand up to 500kg of TNT. Despite retaining the same caliber weapons as the Gangut-class and Project 69, Stalingrad would have mounted new rifles of 61-calibers length housed in proprietary three-gun SM-6 turrets. The 1,400-ton turrets could traverse at a rate of 4.5 degrees per second and raise the guns up to +50 degrees of elevation. Compounded with the rifles' 950 meters per second muzzle velocity, this meant the cruisers could hurdle shells up to 53,000m away every 18 seconds. Another novelty is that in normal operations, all three turrets would have been remotely controlled from the main fire-controlled director. The secondary battery design was also novel; twelve 130mm/58 rifles housed in 6 twin-gun BL-109A turrets. The dual-purpose mounts could hurdle shells 32km every 15 seconds. Complementing them were the light anti-air batteries in the form of 45mm and 25mm cannons, both found in fully enclosed quadruple mountings. The two weapon systems would create protective umbrellas of 12,000m and 2,000m respectively. The process of hull construction for cruiser Stalingrad started in November 1951 at the Nikolayev Heavy Shipyards, with the formal keel laying on New Year's Day 1952. The plan was to launch her by November 1953 to coincide with the anniversary of the October Revolution, but by the start of 1953, she was only 18% complete; well behind schedule. Subsequent to Stalin’s death in March 1953, the project was summarily cancelled. At 70% complete, Stalingrad was launched on April 1954 as a target hulk. By mid-1955, she was towed to Sevastopol Bay where she accidentally grounded on shallow rocks. It wasn’t until 1956 when she was freed and placed in the harbor, where she served as a target for assessment of new Soviet anti-ship missiles under development. Her usefulness ceased by the 1960's, and she was scrapped in 1962. Side and plan views of the Stalingrad class. Presumably the only photo existing of Stalingrad’ hull. Gardiner, R. (1995). Conway’s All the World’s Fighting Ships: 1946-1995. London UK: Conway Maritime Press. [Russian text] Vasiliev, A.M., Morin, A.B. (2008). Stalin's Super Battleships: «Sovetsky Soyuz», «Kronshtadt», «Stalingrad». Moscow, Russia: Eksmo Press. This page was last modified on 7 February 2019, at 22:00.